Fans of mainstream comic books will no doubt be familiar with the name Kubert from one place or another. Younger readers may be familiar with either Andy or Adam Kubert and their comic book work, and older readers will most likely know of Joe Kubert, their father, and his extensive contributions to the medium. It's possible, however, that they may not be aware of Kubert's history with newspaper comics, and especially how extensive it is. Joe Kubert is probably best known for his work on war comics with characters such as Sgt. Rock and The Haunted Tank, his Silver Age revival of Hawkman, or his work on various DC Comics titles over his 70 year career. He's also fairly well known for founding the Joe Kubert School of Cartoon and Graphic Art, located in Dover, New Jersey. The school boasts some fairly famous and successful alumni, and is still in operation. Interestingly, the school's mascot, Tor, is actually a comic book character that Kubert originally created for the St. John Publishing Company, and who appeared in a comic entitled One Million B.C.. Tor was a Tarzan-esque caveman warrior, and first appeared in 1953. After St. John folded, Kubert was able to retain the copyright for the character, and in 1959 attempted to pitch it as a newspaper adventure comic strip. He was never able to convince a syndicate to take it on, but the material he created for the pitch was reworked and published at DC Comics in the 70s. In the 1960s, however, Joe Kubert did draw a syndicated comic strip, though not one with characters that he'd created. Jerry Capp, brother of newspaper cartoonists Al Capp and Elliot Caplin, was to be the ghostwriter of a strip based on Robin Moore's bestselling book "The Green Berets". The strip was to be creditted to Moore, obviously for marketting reasons, though Moore never did any writing on it. Capp first approached comic book artist Neal Adams, but Adams was currently working on another newspaper strip developed by Capp, Ben Casey, and felt he wouldn't be able to take on the extra work. Adams was familiar with Kubert's work, though the two had never met, and suggested Capp contact him. 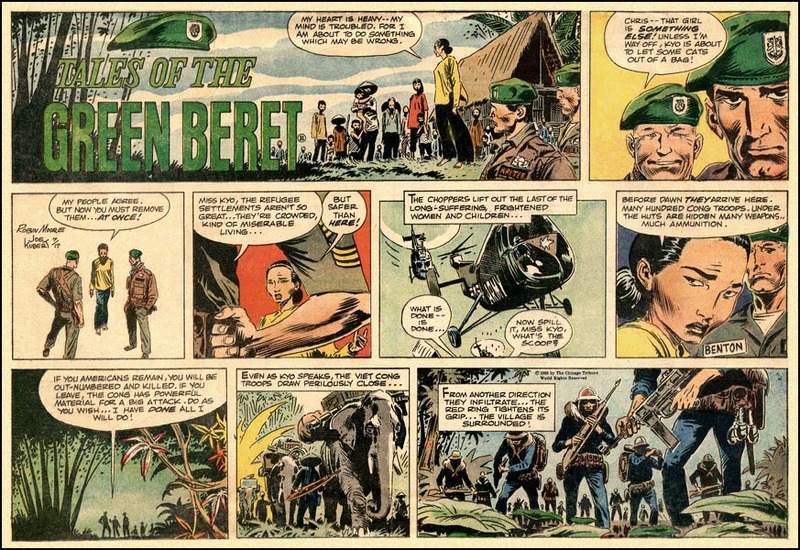 Kubert took the job, and Tales of the Green Beret debuted in September of 1965. Kubert and Capp worked together on it for about a year and a half, but the two butted heads creatively the entire time, and Kubert ultimately left the strip. It only continued for a few more months afterwards, under a succession of various other artists. Also, by that time opposition to the Vietnam War was at its height, and even without the creative struggles, there wasn't much demand among readers for that kind of strip. Most unexpected were the newspaper strips Kubert worked on in the late 1970s. By that time, he had founded and was teaching at the Kubert School. King Features Syndicate approached him and asked him to assist on the artwork for Big Ben Bolt, the boxing comic originally created by Elliot Caplin. Interest in the strip was waning, and there were very few papers that still carried it, so the syndicate would not be able to pay very much for whoever did draw it. Kubert decided that this would be a great opportunity for his students to gain some hands-on experience, so he enlisted some of them in the project. Unfortunately, the workload was too much for them when coupled with their school work, so Kubert ended up drawing it entirely on his own. This didn't last long, though the strip didn't last much longer either, and ended in 1978. A similar situation occured when the New York News syndicate contacted Kubert about assisting on artwork for, of all things, Winnie Winkle, the gag strip originally created in the 1920s. At first, the students were involved in its production, and in fact it was signed "JKS," for Joe Kubert School, but in the end Kubert himself ended up doing all of the work. After a year, Kubert decided it was enough. He did feel it was a good exercise for himself and his students, however, as he was a firm believer that an artist should be versatile and be comfortable working in any style.